Tax season is that time of the year when you’re most at risk of becoming a victim of identity theft and tax fraud. So, here are five things you need to know to protect yourself. Not all data breaches or computer hacks result in identity-theft-related tax fraud. Yes, there are a number of scams out there, and yes, it is possible that some of your personal information has been compromised. There is not a week that goes by that we do not hear about some kind of breach – from Anthem to Target to Yahoo. However, it is important to understand that not every data breach results in identity theft, and not every identity theft is tax-related identity theft. 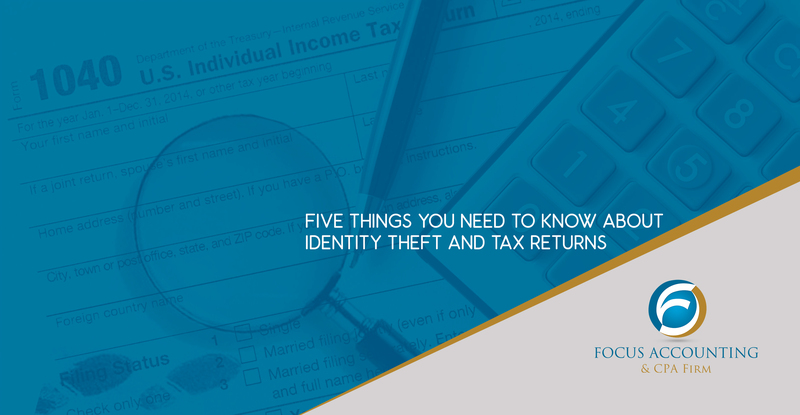 Before you assume that your tax return may be affected, you need to find out what type of personal information was stolen. The Internal Revenue Service (IRS) advises taxpayers who have been victims of a data breach to keep in touch with the company that lost your data. You want to learn what data was lost or stolen, as well as what the company that lost your data is doing to protect you. Some companies may offer credit monitoring or other services to assist you. Filing early does not prevent identity theft. It is true that the IRS encourages taxpayers to file early to reduce the risk of becoming a victim of identity-theft-related tax fraud. That is because if you file first, an identity thief cannot improperly claim your tax refund or wreak other havoc with your tax account. However, it is important to understand that an identity thief cannot file a fraudulent return using your identity without first having access to some of your personal data. Rushing to file an incomplete return is not a good strategy. In the rush to file tax returns early, many taxpayers are under the impression that they can simply file an incomplete or inaccurate tax return now and figure out the details later. This is not a great strategy. Not only does “later” rarely come as planned, leaving you with un-filed or incorrect tax returns, delays in filing properly can cost you in the form of penalties and interest. Not every taxpayer needs an IP PIN. I cannot tell you how many times this week alone I have received inquiries about obtaining an IP PIN. Recent news programs and articles have suggested that the answer to worries about identity-theft-related tax fraud is to obtain an IP PIN from the IRS. That is not completely true. An IP PIN, or Identity Protection Personal Identification Number, is a six-digit number assigned to eligible taxpayers to prevent the misuse of their Social Security Number on a fraudulent tax return. Since you must file your tax return using an IP PIN if you have one, it allows the IRS to verify that you are the correct owner of the Social Security Number on your tax return. However, the IRS does not just hand out an IP PIN to anyone: To get an IP PIN, you must be eligible. Eligible taxpayers include those who received a letter from the IRS inviting them to get an IP PIN (usually this happens once you have been a victim of tax-related identity theft), or those who filed a federal tax return last year with an address in Florida, Georgia, or the District of Columbia (part of an ongoing pilot program since those geographic areas have the highest per capita percentage of tax-related identity theft in the country). You cannot opt in to an IP PIN if you do not meet the criteria. I confirmed directly with the IRS that this remains the case despite news circulating to the contrary. An IP PIN is not a one-time fix. Not only can you not opt in to an IP PIN unless you are eligible, you cannot opt out of an IP PIN once you have received one. If you are assigned an IP PIN, be prepared to use it: You must use your IP PIN when you file your federal tax return not only this year but also in all future tax years. If an IP PIN is not entered correctly on your tax return when you e-file, the IRS will reject the return. If an IP PIN is not entered correctly on your tax return when you file by paper, your return will take longer to process. It is important to be alert and careful this tax season – but do not let panic set in and paralyze you. Take simple steps to protect your financial information, use trusted sources, and watch for announcements and updates from the IRS.